There is no end to recordings of the keyboard works of Johann Sebastian Bach. Discs with his Goldberg Variations, the Partitas and the French and English Suites are released with great regularity. I doubt whether many of these provide us with substantial new approaches to these works. Does this mean that there is no room for recordings of Bach's keyboard works? No, that is not what I am saying. For a start, some parts of Bach's keyboard oeuvre receive less attention, such as the Inventions and Sinfonias. But there are probably more interesting ways to shed light on Bach's keyboard music than simply presenting them as cycles. The disc which Maurizio Croci recorded for fra bernardo is a good example of intelligent and creative programming. The title of his disc is intriguing: what exactly does it mean? Croci explains that in his liner-notes. “The organ and harpsichord pieces presented in this recording mirror each other. Following the same musical inspiration, Bach explores the idioms and technical possibilities of both instruments, often evoking on one instrument the idiom of the other”. The programme includes pairs of pieces which show strong similarity in their idiom and the way the musical material is treated. The connection between the Prelude and fugue in D (BWV 532) and the Toccata in D (BWV 912), for instance, is remarkable. They are written in the stylus phantasticus, which was a feature of the North German organ school. Both are early works and date from the time Bach was strongly influenced by what was written by the representatives of that famous school, and especially Johann Adam Reincken and Dieterich Buxtehude. Interestingly it has been suggested that the Toccatas BWV 910 to 916, which today are generally considered to be works for a strung keyboard instrument, may originally have been intended for organ as well. The comparison underlines that there is not that much difference in idiom between the prelude and the toccata as both have a strongly improvisatory character. Equally striking - but here also thematically - is the similarity between the Prelude in C (BWV 545a) and the Prelude in C (BWV 870b); the latter is the opening of the second part of the Well-Tempered Clavier. Croci points out that both pieces have been preserved in various versions; the two selected here are very close in character and content. The Fantasias and fugues BWV 543 and BWV 944 also are in the same key (a minor). The similarities cannot be overlooked, but there are also meaningful differences which shows that what two pieces have in common, can be worked out in various ways. The Fantasia and fugue in g minor (BWV 542) is assumed to have been written between 1710 and 1725; the Chromatic fantasia and fugue in d minor (BWV 903) cannot be dated with any precision either, but was probably written at about the same time. This explains their similarities, especially in the bold treatment of chromaticism, which was highly unusual at the time. No wonder the latter circulated in more manuscripts than almost any other keyboard work from Bach's pen during the 18th century. These two pieces are played here in immediate succession which makes their similarity even more striking. That is different with the other pieces, and that is the second explanation of this disc's title: the programme is also structured as a mirror. The advantage is that we don't switch from organ to harpsichord and vice versa after every piece. This allows to get used to the different instruments and the respective acoustical circumstances. The disadvantage is that one doesn't hear similar pieces in their 'logical' order. But with the help of technology that can simply be 'corrected'. It is helpful that in almost every case prelude or fantasia and fugue are allocated to different tracks. As I said, this is a model of creative programming. It is also quite instructive to bring together pieces which show strong similarities. It helps to increase one's understanding of the compositional process and the differences and similarities in Bach's treatment of the respective instruments. The differences cannot be overlooked, but I was especially struck by the similarities. It would be interesting to hear some of Bach's harpsichord works from relatively early in his career in performances on the organ. I have greatly enjoyed not only Croci's programming, but also his performances. He plays two beautiful instruments: a harpsichord by Andrea Restelli, after Hieronymus Albrecht Hass (1723), and an organ, built in 1787 by Johann Melchior Grob, which was restored in 1993 by Jürgen Ahrend. Croci's interpretations are characterised by a rhetorical approach and his playing is gestural and speech-like. The contrasts between the various sections - a feature of the stylus phantasticus - are convincingly conveyed. Only in the organ pieces, I probably would have liked some more breathing spaces here and there. 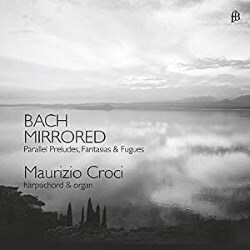 Croci's tempi are generally pretty fast, and musically I find them mostly convincing, but in the case of organ performances one has to take the acoustic into account. It is thanks to his clear articulation, that the musical discourse never becomes muddy, but even so I felt that sometimes certain phrases and figurations could have been singled out more strongly through short pauses, in order to emphasize the following statement. However, these are only minor issues in what is a most interesting and musically compelling recital.